A royal piece of Winnipeg history is going up for auction in the new year. The massive portait of Queen Elizabeth II hung from the rafters in the old Winnipeg Arena for 20 years — and was sung to by scores of NHL players when the Jets played in that barn. It is set to go on the auction block in 2012. The five-by-seven metre painting was commissioned in 1979 by Manitoba Lt.-Gov. Francis Laurence Jobin specifically for the arena. But it has been homeless since it was taken down prior to the arena's demolition in 2005. After coming down, the painting went for restoration work — including repairs to the marks left behind by hockey players who used to try to hit the Queen's mouth with the puck. It spent a couple of years in an arena in Souris, Man., before moving east. It's currently owned by a Vancouver singer, Tim Lawson, but for the past 10 years it has been sitting in a Whitby, Ontario warehouse. Rumours surfaced in May of this year that the portrait might be coming home, along with the return of the Jets. The caretaker of the painting told CBC she has no idea what the painting is currently valued at. And there have been no offers from anyone from Winnipeg, she noted. 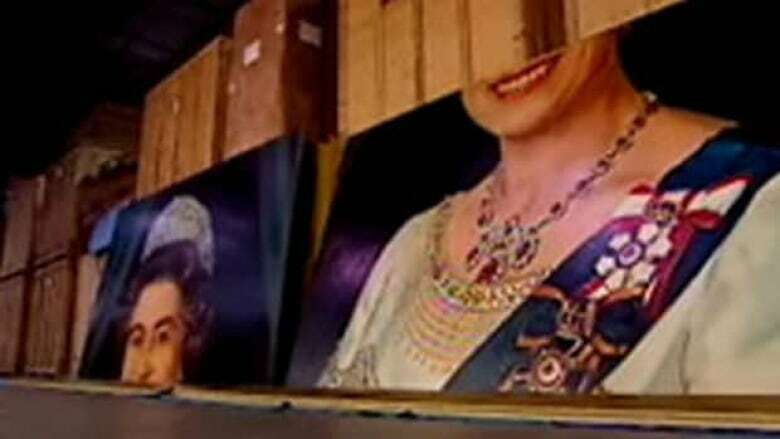 Queen arena portrait returning to Winnipeg?